Not being a native of Utah, I've noticed how many Utahns take this amazing lake for granted. But having a dad who loves to boat and water ski, I've learned having a lake as large and warm as this within driving distance is a benefit to appreciate. The enormity of this lake is overwhelming. Of course, we only saw one small fraction of it on our visit (outlined in pink.) I'm told Powell has more shoreline than the entire United States coast line because of all the arms and crags. 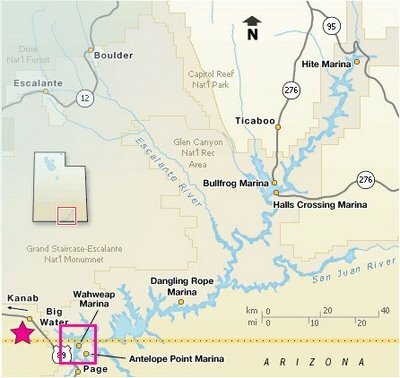 The pink star (by Big Water) is where Tom's trailer has spent the winter while he frequents the job he has been working on there. This map is a closeup of where we spent our time. (This is for my parent's benefit since we are working on them to come down here). Lone Rock Road leads to a public beach, shown below. This is a vast sandy beach. 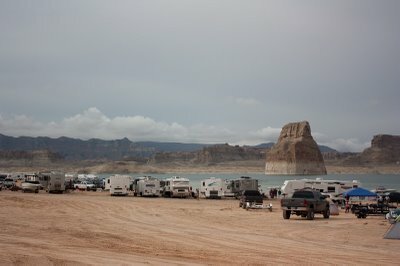 I was impressed by the fact that people could pull in and park wherever they want, put their boats in the water wherever they want, and set up camp. There were a lot of people there, but it didn't seem crowded. 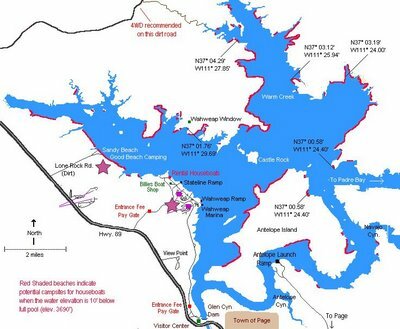 A little further down was Wahweap Marina which had campgrounds with full facilities and boat ramps. This picture shows Lone Rock in the background. It sticks up right out of the middle of the water. 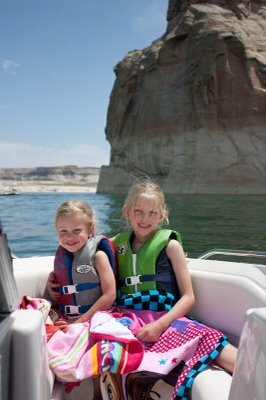 We tubed with the girls a little bit here, and the water was already warmer than most Montana lakes get all year. The weather turned a bit stormy after that, so we headed out to explore the lake (or a tiny portion of it, as you can see from the map). 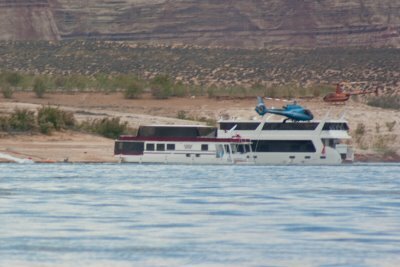 You know you have $$dough$$ when your helicopters drop you and your family off on top of your double-decker houseboat that is parked on a remote beach and ready for you to enjoy for the week. 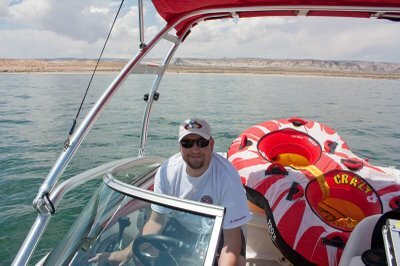 But, on our more limited budget, we still enjoyed the speedboat we rented for the day. See the big smiles across their faces? Grandpa? 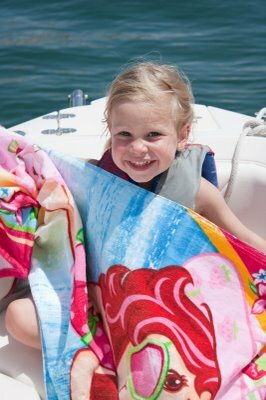 Wouldn't you love to see those smiles brighten up your boat for a weekend?